Our two dogs Bella and Baby Bear were showing some fear/aggression towards some dogs, and generally wanted it their own way. They would run in and out of the house, sometimes escape from our yard to come back hours later. They had also started getting into dog fights when they would get loose. We had our doggies with the good folks at Zenergy for boot-camp. We were amazed how within a handful of days we started to get videos of our dogs playing with other dogs, and out at the pet store and exhibiting zero problems we’d seen before. When we got our dogs back, they obeyed, waited for us to be ready before walking through every door or to jump in the car. Mostly, they seemed to be over their fear of other random animals/dogs. 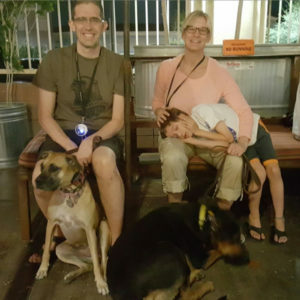 They came back to us so much closer to our ideal dogs, and we loved the education we (the owners) also received about dog ownership and being the leaders of our pack as well. That has helped us maintain the discipline and not have our doggies regress to old habits. Could not recommend these folks more! Five stars and tons of gratitude to K and RJ!! !